I am happy that we had books in the house when I was a child and that I had parents that read and taught me the value of reading. A precious memory of my father is seeing him always sleeping with a book or a magazine on his chest. Mom too always encouraged us to read and also was an avid reader, particularly it seemed, of the Bible, The Reader’s Digest, religious tracts and nutrition books. During my childhood we had two periodicals always in our home: Time magazine and The Reader’s Digest. I read them both thoroughly. Even after becoming a college student at Rutgers, I spent lots of time, too much as indicated by my grades, in the stacks looking at old bound issues of Time, which brought back many memories. I remember as a youngster reading an article about the singer Patti Page with a mesmerizing photo of her in a 1955 issue of Time and was able to find that same issue in the stacks at Rutgers. In the Reader’s Digest I read most of the articles and certainly all of the jokes under the different headings: “Laughter is the Best Medicine”, “Humor in Uniform” and “Life in These United States”. I also read many of the condensed books at the end of each issue. Several affected me deeply, among them “Little Boy Lost”, about a little boy separated from his parents during World War II and miraculously reunited with his father again, and two autobiographical books by Ralph Moody: “Little Britches” and “Man of the Family”, in which a little boy helps his family make a living on a Colorado ranch and later at age 11 when the father dies, with hard work, ingenuity and the help of his brothers and sisters manages to support the family. Both “Time” and “The Reader’s Digest” embraced an essentially conservative, patriotic, view of America, reflecting my parents’ political opinions. I too was a good little Republican for many years, also embracing the views reflected in “Time” editorials and “Reader’s Digest” article selection. As a child in our first house in New Jersey, I became acquainted with the moralistic Sunday school books called “Uncle Arthur’s Bedtime Stories”. They were all stories with morals, maybe a bit like religious Aesop’s Fables. In these stories, bad things happened to the little boy who lied to his mother; the little boy who helped his mother and took care of his brothers and sisters would find a ten dollar bill on the sidewalk. How hilarious to later read Mark Twain’s “Story of a Good Little Boy” and “Story of a Bad Little Boy” in which nothing happened they way it happened in the Sunday School books: the good boy never was rewarded but was beaten and chastised for his good deeds and the bad boy enjoyed what he had stolen and didn’t fall out of the tree and break his arm. Looking back, I really used to think I would find a treasure someplace when I helped around the house, with which I could provide my parents and my brothers and sisters a better life than they had. But it never happened. 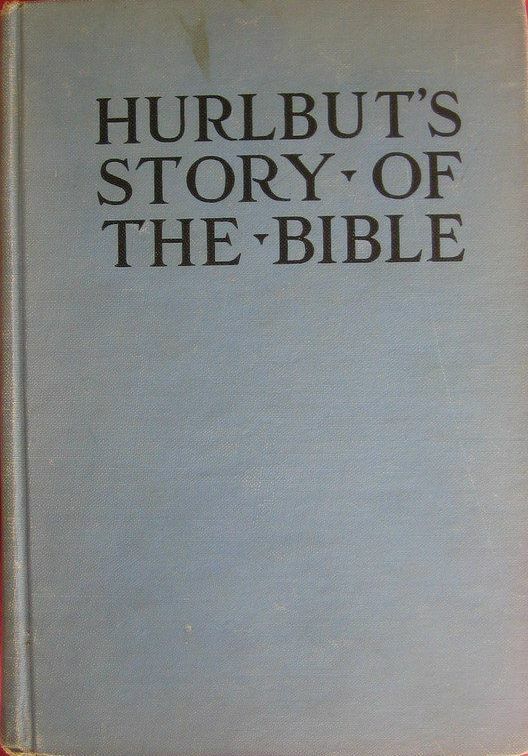 When I was twelve years old, I received from my mother a volume of “Hurlbut’s Story of the Bible”. This classic book went through countless editions over the years. 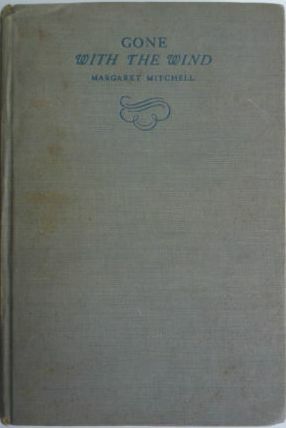 My volume, which I still have, is the light blue cover 1947 edition. I read this book from cover to cover, even memorizing certain stories to tell on the “The “Children’s Hour” radio program over the church radio station, WAWZ. The illustrations in the book were wonderful and I can still see many in my mind’s eye today. And in these old editions of “Hurlbut’s” all the difficult Bible names had phonetic spellings in parentheses. Also in the 1950’s, when they were visiting my parents and took a trip to New York City, I received a couple of books from my Aunt Margaret and Uncle Emil. One, called “American Statesmen” was not that interesting, but the other, titled “The Gudrun Lay”, was the story, in great prose as I remember, of Sigurd, Brynhild, Gudrun, Regin, Fafnir and the rest, and became a book that I read again and again. Unfortunately, that book has long disappeared and efforts to locate another volume have been futile. The closest I can get to it is “The Legend of Sigurd and Gudrun” by J.R.R.Tolkien, very academic and certainly not the book I read and remember. 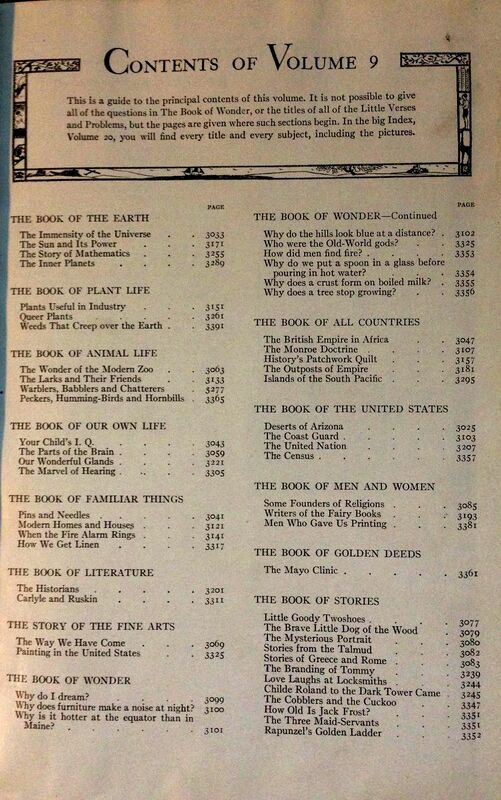 Undoubtedly the books that influenced me the most were a set of “The Book of Knowledge”, probably a 1941 edition. Each volume was arranged in sections called “books” themselves: The Book of Familiar Things, The Book of Stories, The Book of Golden Deeds, The Book of Men and Women, The Book of Literature and others. 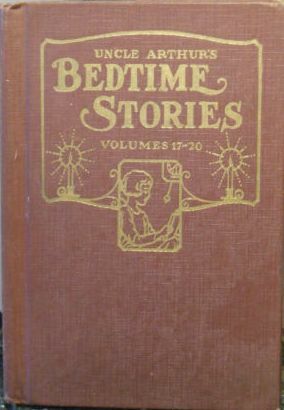 All the classic fairy tales and classic poems were in these books, as well as biographies, lots of history, answers to perennial questions (The Book of Wonder), explanations of manufacturing, descriptions of famous cities and buildings, information about plants and animals and, in short, just about anything one could think of or might be curious about. I do not remember ever looking up certain topics. These were books you simply picked up and then quickly got involved in something compelling and couldn’t put down. And they were books that you would usually find strewn all over the house – rarely together on their shelf. Though solidly bound, this set of books eventually became beat up and ragged, a pleasant indication of heavy usage. “The Book of Knowledge” contained my first King Arthur stories and I can still remember the dramatic illustrations of Sir Lancelot, Elaine of Astolat, Queen Guinevere, Sir Gawain, Sir Galahad and Sir Percival. It was where I found the long poems I memorized: “Robert of Lincoln” by William Cullen Bryant and “Darius Green and His Flying Machine” by John Townsend Trowbridge. They were where I first learned about Marie Curie and Albert Einstein, about Shackleton, Amundsen, and Scott, and about photosynthesis and combustion. Bringing these marvelous books into the lives of me and my brothers and sisters is a tribute to the care of my parents, although I know nothing of when and how they were obtained. 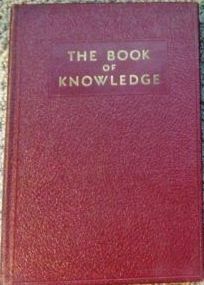 “The Book of Knowledge” was simply always there as long as I can remember. 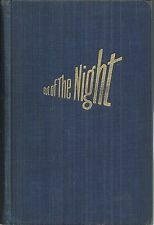 When I was about 12 years old I remember reading a book of my Dad’s that maybe I was not old enough to read – “Out of the Night” by Jan Valtin, a 1941 best seller about the career of a communist spy who was captured and tortured by the Gestapo. This book made a powerful impression on my young mind, maybe not all of it good. I developed an unreasonable fear of communism and its incarnation in the “Comintern” (Communist International) and a horror of torture, as described in the book. The latter memory came back to me in a big way recently when my own country and its leaders employed and even tried to rationalize torture, something that, when reading this book as a youngster, I could never have imagined. I mentioned in an earlier post that my father used to take us kids with him to the “Auction” on Route 206 near Somerville, New Jersey where I often visited a used book booth and bought a few books that I enjoyed very much. It was there that I bought my “Three Musketeers” and “Twenty Years After” by Dumas, my Mark Twain’s “Innocents Abroad”, Dickens’ “Great Expectations” and Margaret Mitchell’s “Gone with the Wind”, each costing me considerably less than less than a dollar. 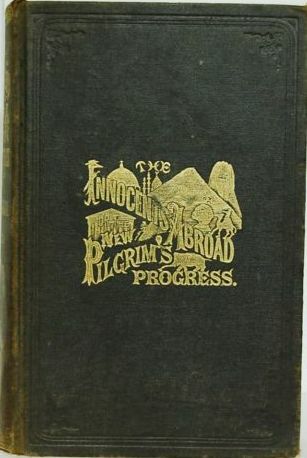 “Innocents Abroad” was actually a first edition, in very good condition but I unfortunately had no sense of its value and proceeded to completely abuse it and wear it out. And “Great Expectations” has taken a beating too since I have read it at least three times. But all of these books I still have and keep together in the bookcase because of their special importance and meaning in my life. Another part of my childhood reading life is worth mentioning. My mother always did her best to make sure we went to sleep at an appropriate time and there were many times she made me stop reading and turn the light out in the bedroom that I shared with my younger brothers. However, there was always a hall light on and she allowed the door to be open a bit to give us a bit of night light. So I cut the top off a Dutch Cleanser container and hung its shiny bottom circle from a nail on the wall above the dresser. When aimed properly this circle of reflective metal would provide a spot of light on my bed which illuminated page after page of forbidden post bedtime reading. What fun, reading while everyone else in the house was asleep in total peace and quiet – something I still enjoy immensely to this day. So books were very important to me as a boy and are still are essential in my life. I enjoy so much standing in front of my bookcases appreciating and remembering. Books I have read are important but, so are the books I have not read. These are in special locations, beckoning to me, inviting me and demanding to be read. Since I am now in a late stage of my life and can reasonably speculate on how many years are left, I only hope and pray that there will be enough time. But sadly I know there will never be enough time since now, even this very day, I am reading reviews of newly published books that I add to my “must read” list. But no matter old I get, I hope I will always look forward to each new book experience with the same excitement and anticipation I enjoyed as a boy.